With state-of-the-art equipment, including an auto-refractor, computerized visual field analyzer, Optomap retinal imager, and more, our doctors provide a comprehensive examination and recommend quality vision solutions for your visual needs. Most doctors charge extra for examining your eyes to see if you're right for LASIK. At Stein Optometric Center, LASIK Consulations are always free. So, if you are interested in LASIK surgery, please request that your doctor do a complimentary refractive surgery screening and consultation. We also do children's examinations. If you notice that your child's eyes are often red, or they squint to read or see small objects, blink their eyes excessively or complain of headaches or double vision, you should consider an eye examination. Visit our Kids, Tweens & Teens learning center to find out more about eye care, challenges, and products for your young ones. routine eye exams are important to maintaining good eye health. Often, eye and vision problems do not have obvious symptoms or signs, but are easily diagnosed by a licensed optometrist. 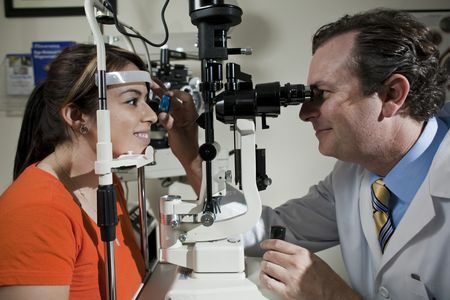 By diagnosing eye and vision conditions early on, our optometrist is able provide treatment options and in many cases restore or prevent vision loss. The American Optometric Association recommends yearly or bi-yearly eye and vision exams, depending on whether you are at-risk or not. With state-of-the-art equipment, including an auto-refractor, computerized visual field analyzer, retinal camera, and more, our doctors provide a comprehensive examination and recommend quality vision solutions for your visual needs.